Sun Tzu’s treatise on the “Art of War” is well known and offers some insights into how system operators, engineers, and contractors can thrive in a complex and volatile environment for 2019-2022. In this context, the true enemy is poorly executed capital construction, maintenance, or operations activity. In the words of Sun Tzu, “If you know the enemy and know yourself, you need not fear the result of a hundred battles.” So let’s get to know the enemy and know yourself. 2016 – Sluggish U.S. economic growth where quarterly GDP remains below 3 percent. 2018 – Growth accelerated, both 2nd and 3rd quarter exceeded 3percent; a historically high rate. 2016 – Sluggish global GDP growth results in lower commodity demand. 2018 – Return of global growth representing a significant improvement over 2015/2016, tariffs have and will continue to mute this growth. 2016 – Consumer Confidence Index (CCI) slowly improving from 2010 and flattening during 2016. 2018 – CCI began a rapid accent in 2017 and is approaching a historic record last achieved in 1999. 2016 – Both national and construction unemployment falling steadily since peaks in 2010. 2018 – Both national and construction unemployment at historically low levels. Monthly job additions since January 2017 trending up and are increasing workforce participation. 2018 – Loosening production began during 2017 and continued while oil prices moved higher in 2018. 2016 – Rig count at lowest point since 2009. 2018 – Rapid run up in rig count, production output, and related activity since 2017. 2016 – Peak oil price in June 2014 at slightly more than $100, falling below $40 in early 2016. 2018 – Oil moving up to $60+ and remains in a sweet spot; pricing works for buyers and producers. 2016 – Peak U.S. natural gas price in 2014, falling to $2 in early 2016. 2018 – Natural gas price low and stable at approximately $3. The pipeline market was punished by low commodity prices in 2015-2016. Since Trump’s election, it has rebounded and exhibits a flurry of activity. We believe this activity is an attempt to get as much work done as possible prior to the 2020 election cycle, after which the business and political environment are unknown. 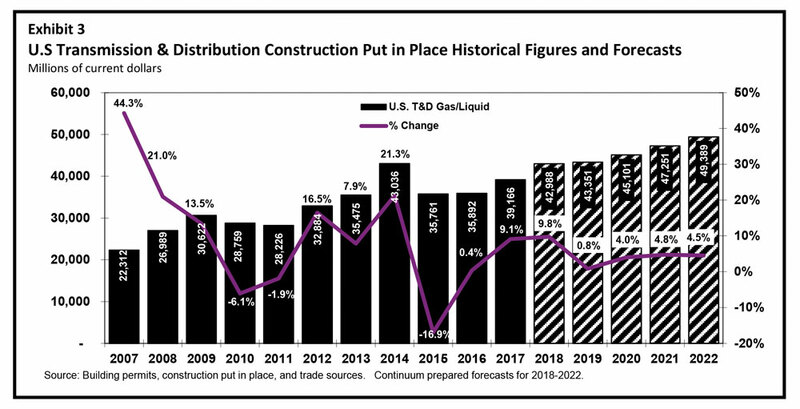 The distribution construction market is largely disconnected from exploration and production impacts and a low natural gas price continues to create more demand for distribution construction services and support steady growth. 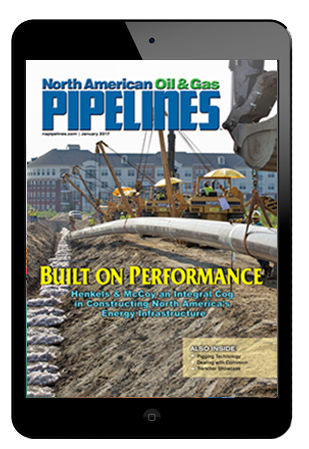 Long-term, the prospects for both the pipeline and distribution markets are solid and will continue to exhibit growth. Both the Interstate Natural Gas Association of America (INGAA) and American Petroleum Institute (API) are equally bullish. However, we still face many challenges. Trade and supervision workforce availability issues are perhaps the greatest challenge for both pipeline and distribution markets. A more recent challenge is the tariffs imposed by the Trump administration and the subsequent retaliatory tariffs imposed by various trading partners, including our Canadian allies. The high use of imported steel in the construction of transmission and high pressure distribution assets is a particular venerability of this market space. A broader and significant risk is that this trading environment creates a drag on global economic growth and could ultimately turns into a full on trade war which would be catastrophic for all parties in the short-term. The impacts of these tariffs is already visible on commodity prices and while the current price increases are digestible, a continuation of this trend is not. The recent stock market performance and fear of a bear market have many firms and leaders worried. In addition, we are entering at the very end of the longest economic expansion the U.S. has ever enjoyed…every expansion ends the same way…in a recession. We are currently forecasting a short and shallow recession in 2019 that will dampen growth but not stop it. The tariff challenges mentioned previously are one factor that could particularly deepen and lengthen a recession. Beyond 2020, the pipeline market will continue to exhibit periodic volatility and we remain very bullish over the next 15 to 20 years of opportunities in both the distribution and pipeline space. Sun Tzu described that “Water shapes its course according to the nature of the ground over which it flows; the soldier works out his victory in relation to the foe whom he is facing.” There are, and will always be, obstacles to the successful execution of capital construction, maintenance, or operations activity, adapting to them is critical. Following is a review of the landscape of both the Canadian and U.S. pipeline and gas distribution markets to assist the reader in adapting. Canada exited its short 2015 recession in early 2016 and GDP growth remains positive although well below 2 percent. Canada is an export based economy and the slowing global growth and resulting low commodity prices hurt Canada more severely than the United States during 2017/2018. Now, the tariff conflict will also serve as an obstacle to more rapid growth. Ultimately, the United States and Canada need each other. The preliminary replacement for NAFTA and the potential to eliminate the steel and aluminum tariff dispute will yield stronger relations and a resumption of deeper economic ties. 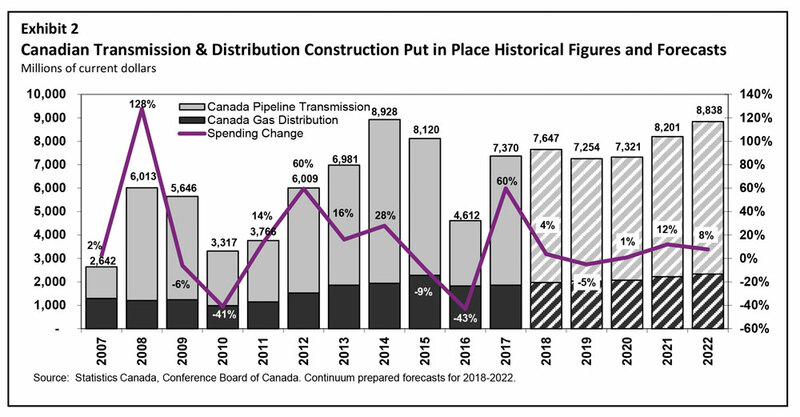 The Canadian pipeline and dis-tribution construction market is much more influenced by liquid gathering and transmission activity than the United States. In Exhibit 2, the history and forecast of the Canadian transmission and distribution markets demonstrate the volatile nature of the Canadian market. Today, there is approximately $2 billion in annual distribution system capital spending with transmission spending making up the rest of the market. Total spending peaked during 2014 and 2015 and we are forecasting another peak in 2018/2019 with the relatively high price of oil. The current government in Canada is less business oriented and has tended to both raise obstacles to projects and support project activity. The recent Canadian government purchase of Kinder Morgan’s Trans Mountain pipeline for $4.5 billion (CAD) is one example. The Canadian government described this effort as “hoping to save a project that faces formidable political and environmental opposition.” Prior to this intervention, Kinder Morgan was threatening to cancel the project. The Canadian distribution markets remain stable and slow growing. Sun Tzu describes, “The rule is, not to besiege walled cities if it can possibly be avoided,” and the government purchase of the Kinder Morgan project might be classified as attacking a walled city given the pushback on the project within Canada. The U.S. pipeline and distribution market is more diversified than Canada and the pipeline portion of this market is a smaller percentage and has multiple drivers. U.S. pipeline contractors were thriving through 2014, suffering in 2015/2016, and are now thriving again which we forecast will continue through 2020. The 2016 slow rise in the price of oil, the OPEC production agreements, support from Trump for energy infrastructure, and a more aggressive and hopefully long-term energy policy has improved the gas/liquid pipeline market and it shows in both capital spending and permitted or planned projects. In Exhibit 3, our spending forecast shows the downturn experienced in 2015/2016 when the typical U.S. pipeline contractor saw revenues fall between 40 percent and 60 percent since the 2013/2014 peak. Station and maintenance contractors were less affected by these changes. 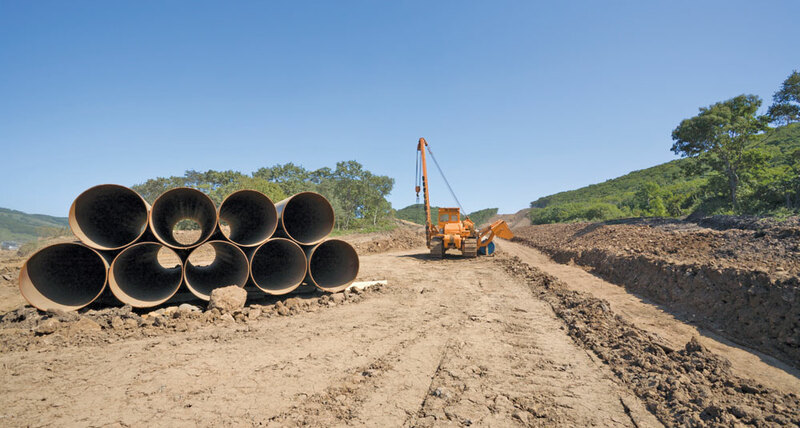 Since that point, a substantial resumption of growth has taken place for pipeline and distribution activity in 2018 and some flattening of growth is expected in 2019, followed by an additional flurry of activity in 2020 as work accelerates on pipeline projects. The distribution markets remain strong. Looking forward into 2020-2025, we see shifts in the nature of the distribution work that is occurring from broad accelerated asset replacements to more general modernization, and integrity related programs but no shift in total spending. This shift will require contractors to take a hard look at their service offerings, better understand where their customers are headed and then decide if they want to follow the spend patterns of their customers or potentially search for new customers with whom their current capabilities fit. Sun Tzu shared, “If it is to your advantage, make a forward move; if not, stay where you are.” In this case, distribution contractors should search for their advantage, and move forward…standing still is the only mistake. “The good fighters of old first put themselves beyond the possibility of defeat,” counseled SunTzu. How will you accomplish this for your business? Let’s start with a review of our greatest challenges including regulation, environmental protest, global tariffs, economic recession, and the pressing question of, “Who will do the work?” Regulation and environmental challenges are becoming more aggressive and thoughtful owners, contractors, and designers will work with stakeholders to find solutions that create high wage jobs, comply with regulation, and protect the environment. Building a workforce to complete 15-20 years of potential work is perhaps a larger challenge and we are aware of several efforts to help meet this challenge led by industry stakeholders. The Distribution Contractors Association (DCA) is undertaking the hard work of attraction and retention in our industry space and investing in our future through a partnership with Mike Rowe of “Dirty Jobs” fame and SkillsUSA. Many readers will never have heard of SkillsUSA who has developed a set of training and competition program to replace the lost trade skills programs many of us remember from high school. Ultimately, all construction is local and growing rather than hiring local resources is the answer. Mark Bridgers, Dan Campbell, and Jay Rendos are consultants with Continuum Capital, which provides management consulting, training, and investment banking services to the worldwide energy, utility and infrastructure construction industry. They can be reached at (919) 345-0403 or MBridgers@ContinuumCapital.net and followed on twitter at @MarkBridgers. For more information on Continuum, visit www.ContinuumCapital.net.